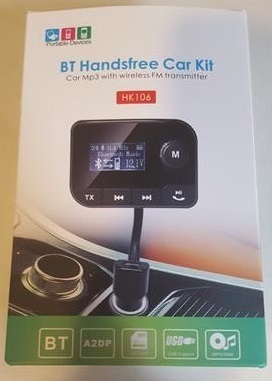 The HK106 is a Bluetooth FM Transmitter that can Pair a smartphone to a cars stereo and have hands-free-calling or play music. It also can play music from a SD-Card inserted into it. 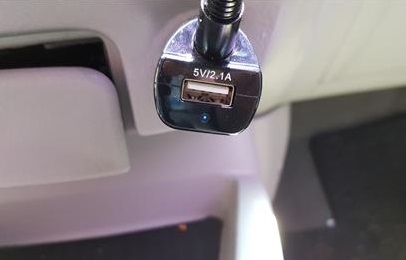 The unit has a built-in microphone so it can easily transmit calls to a phone and carry on a conversation over a vehicles speakers. 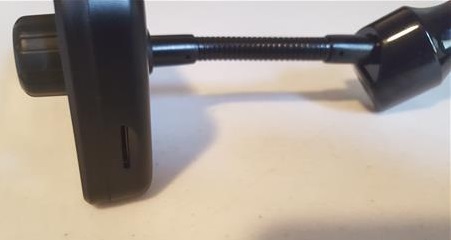 The package comes with the HK106, instructions and a 3.5mm cord. 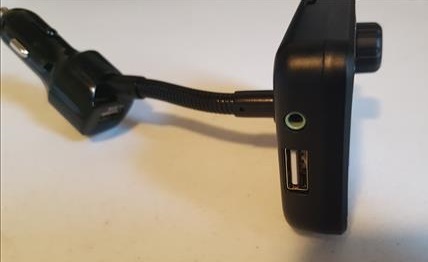 One side has a USB slot and a 3.5mm audio jack for any non Bluetooth devices. The other side has a slot for a SD-Card which can be loaded up with music and inserted. It can play MP3, WMA, WAV, APE and FLAC file formats. It has a nice display along with big buttons for Volume, TX, Previous, Next, Play/Pause, and Calls. It also has another USB port at the bottom to plug in other deices. 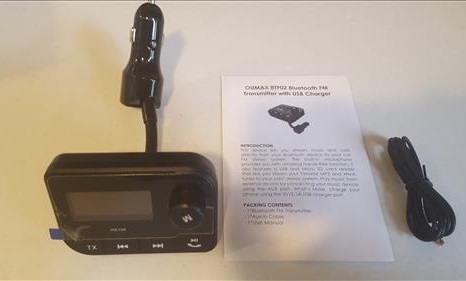 The setup is easy to do by plugin in the transmitter into a cigarette lighter socket. 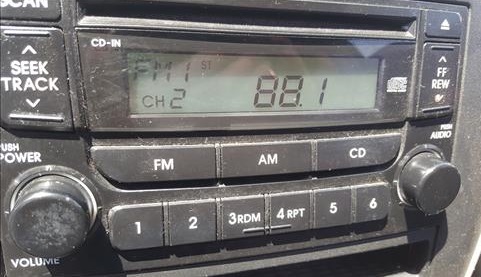 Set the car radio to a open FM frequency with no station on it. Here it is set to 88.1. 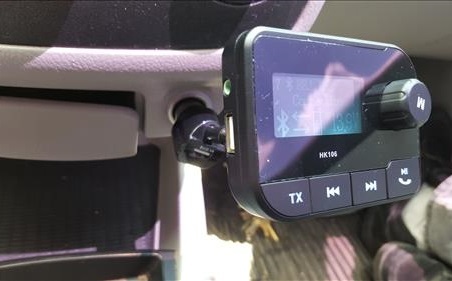 The FM transmitter is set to the same frequency the radio is on. In this example 88.1. 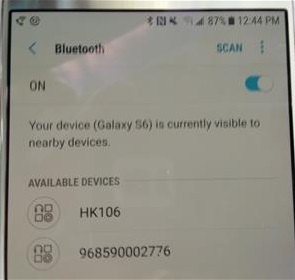 Go into a smartphones Bluetooth settings and look for the HK106. 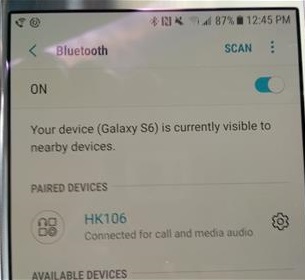 Touching it will Pair the smartphone to the HK106 allowing all calls and music from the phone to play over the cars speakers. This includes music from online sources or stored on the phone. 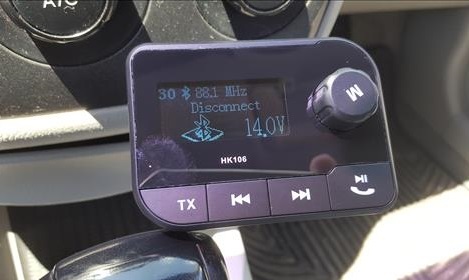 The built in microphone on the HK106 picks up your voice when talking on the phone and the call carries on over the vehicles speakers. 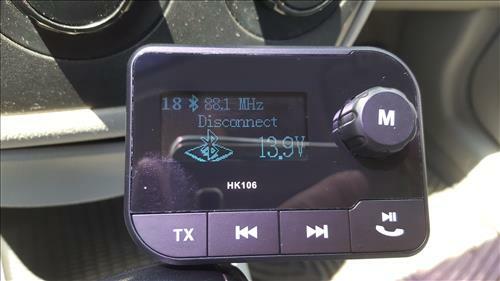 The HK106 Bluetooth FM Transmitter is a good unit to use and play music, or make calls from a smartphone over a vehicles stereo. The built-in microphone works very good at picking up voice calls. Play back of music over a car or trucks speakers is also very good but will of course depend on the speaker system. How good music sounds over the stereo will always depend on the stereo system installed. Overall the HK106 is a good low cost unit that does what it was built to do.